Falling asleep to a movie on Netflix is a wonderful feeling, but one that can turn to frustration the next day as you try to figure out where you left off. It’s one problem that Netflix engineers tried to solve during an internal company Hack Day last week, according to TechCrunch. The hack involves using a Fitbit wristband to detect when the user has fallen asleep. 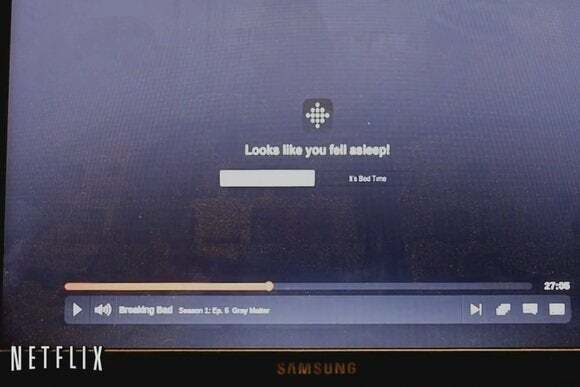 When snoozing commences, Netflix slowly fades the audio and puts the movie on pause. It also creates a bookmark at the point when sleep began so snoozing users can easily return to that point later. Fitbit only detects sleep by measuring movements after the user has turned on “sleep mode,” so the feature might not be ideal for mid-day naps. It could be useful, however, if you were planning on dozing off for the night in front of the television. On the other hand, Netflix told Ars Technica that “it is possible that one or a few will.” It would seem odd for Netflix to upload several of its hack videos to YouTube if there was no chance for any of them to become actual features. Some of the other ideas that came from Hack Day include custom playlists, a way to let house guests watch Netflix through your account,PIN protection for user profiles and a better text entry method for game consoles.